Fudgy Chocolate Pie - Gluten-free! Preheat oven to 350° F (180° C). Prepare an 8” (20 cm) pie plate (I use coconut or avocado spray or rub with butter or coconut oil). Melt chocolate and butter over low heat until smooth. Cool slightly and whisk in sugar and eggs. Blend in vanilla, g-f flour and salt. Pour into pie plate and bake approx. 25 minutes, until set. Pie is meant to be very fudgy and moist - do not overbake! Delicious warm with frozen dessert (non-dairy or ice cream and fresh berries! 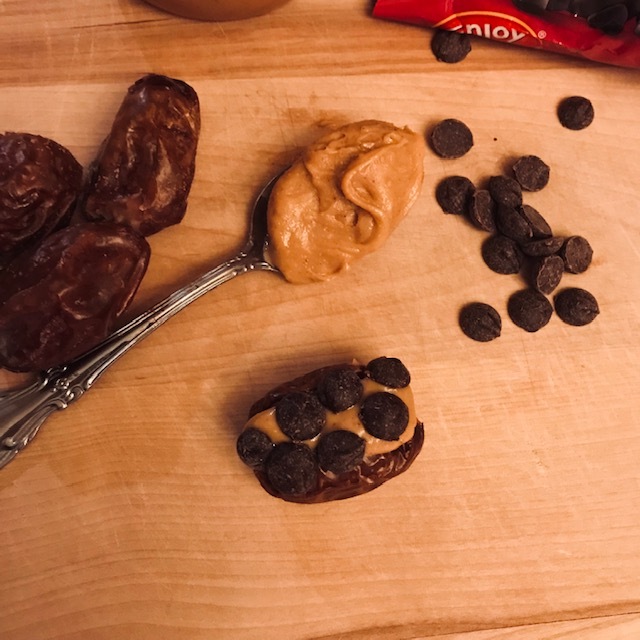 Easy 3-ingredient Nut Butter "Cups"
Slice open desired number of dates (aka “cups”), remove the pits and fill with your choice of nut or seed butter. Top with dark chocolate chips and devour. Preheat the oven to 350 degrees F. Line a cookie sheet with silpat or parchment paper. 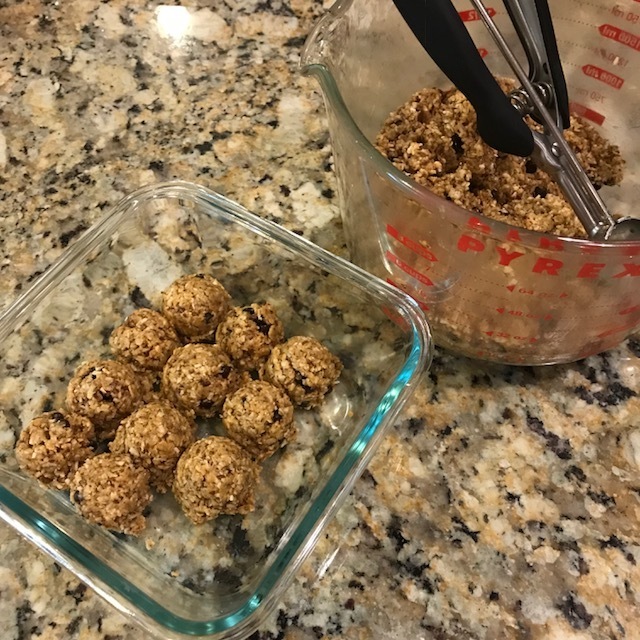 In a medium bowl stir together almond butter, coconut sugar, vanilla, egg/flax egg, and coconut oil. Add the almond flour, coconut flour, baking soda, salt, and cocoa powder and chocolate chunks and stir with a spatula until smooth. The dough will be very thick. It also is very oily (that put me off a bit, but the cookies baked up beautifully). Scoop heaping tablespoon sized mounds of dough onto the prepared cookie sheet. These cookies don’t spread or flatten much, so press down with your fingers or the back of a cup. Bake for 12 minutes. Do not overbake! Let cool on the cookie sheet for a few minutes before transferring to a cooling rack. 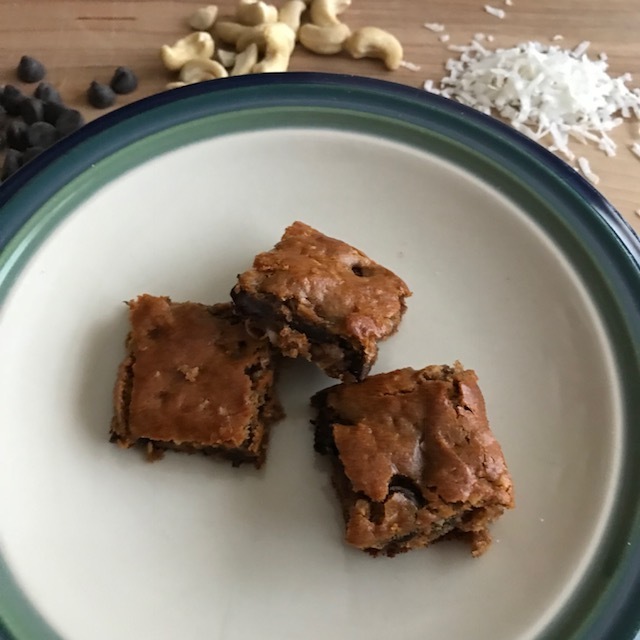 Optional - a handful of nuts, dried cherries, flaked coconut. Preheat oven to 350° F (180° C) . Grease a 9x9 inch baking pan with coconut oil or line with parchment (pictured above). In a large bowl, combine the tahini, coconut sugar, maple syrup, vanilla extract and eggs until smooth and well combined. Gently fold in cocoa powder, coconut flour, salt and baking soda until batter is smooth. Fold in 1/3 cup chocolate chips into the batter. This batter will be thick and somewhat sticky. Spread batter evenly in prepared baking pan. Bake for 22-26 minutes or until wooden toothpick inserted into the middle comes out clean or with just a few crumbs attached. Do not overbake! 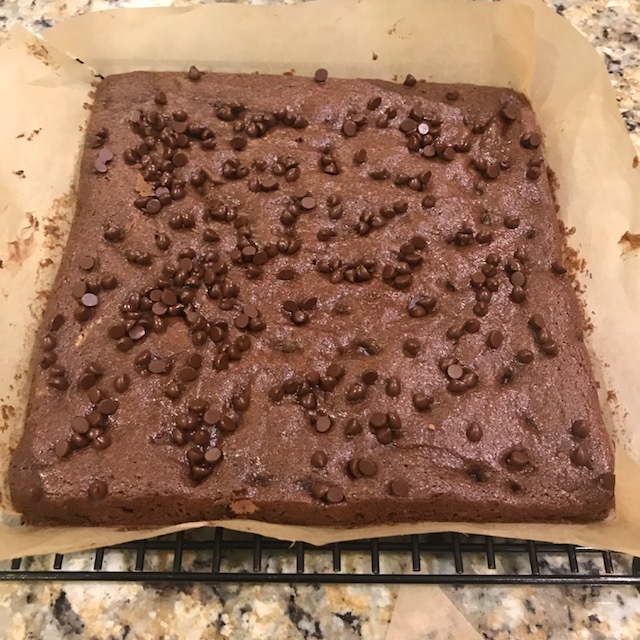 Optional: as pictured above, after brownies have cooled a few minutes, sprinkle with additional chocolate chips or drizzle with melted chocolate. 1. Preheat the oven to 400°F. Grease 12 muffin cups with coconut oil, or line with papers. 2. Place the almond butter, bananas, coconut oil, honey, eggs, baking powder and vanilla extract in a large bowl and mix until well-combined. 3. Divide the mixture between the prepared muffin cups. 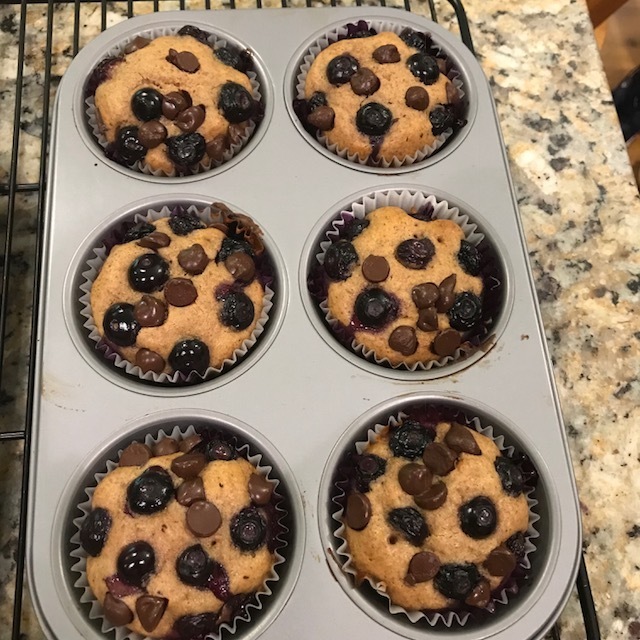 Place the blueberries and chocolate evenly on top. 4. Bake until a toothpick inserted into the muffin comes out clean, 12 to 15 minutes. Cool and enjoy! In a microwavable bowl, add the chocolate chips and melt until you have a smooth mixture. Allow it to cool down but make sure it doesn't harden. Chill your mixing bowl in the freezer for 15 minutes. Shake the can of coconut cream well, add to the chilled bowl and beat on high for a 30-60 seconds to blend well. Add the melted chocolate, cacao or cocoa powder, vanilla and optional sea salt, and mix until thoroughly combined. Cover the bowl chill the frosting for 1-2 hours until slightly firm. Remove the bowl of frosting from the fridge and whip it until it becomes fluffy. Spread (or eat with a spoon) and enjoy! The original recipe had no added sweetener and I found it needed a bit, so I added 10 drops of stevia. Chill the freezer bowl of an ice cream maker in the freezer for at least 2 hours before making the ice cream. Combine all the ingredients in a blender and blend on high-speed until the raspberries are fully broken down and the mixture is creamy, 1 to 2 minutes. Taste for desired sweetness - I find about 10 drops of stevia is just right. You can also add a hit of honey or sweetener of choice. Transfer mixture to the chilled ice cream bowl and start the machine. Once churned, you can enjoy it immediately (a soft-serve texture) or place it in the freezer until firm, 2 to 3 hours. Remove 10-15 minutes prior to serving to allow it to soften. Grain - free! And yes, this is the correct ingredient list - no flours or meals at all. It puffs up beautifully just like a blonde brownie. Add egg and vanilla and mix until well incorporated. Bake for 18-24 minutes or until a toothpick inserted in center comes out with dry crumbs. 18 minutes works great for me - best not to overbake. Note: The dough will be firm and sticky. Don't worry, it will come together when baked! In a medium bowl, whisk together the EVOO, nut butter, honey and vanilla until well combined. Blend in the oats, coconut, flax meal until well mixed, then add any optional ingredients. Chill in the fridge for 30-60 min until firm enough to hold shape and use a scoop or your hands to roll into balls. Store in the fridge and enjoy! Preheat the oven to 400° F (200° C). I prepare one filet per person. If they are very small, you may have 2 per person or if very large, it may serve more than one. Cut a sheet of parchment large enough to fold over the filet. Lay orange slices in a row the length of the filet. Place the filet on top, drizzle lightly with olive oil, salt and pepper to taste and sprinkle dried thyme or place fresh sprigs on top. To wrap the fish, bring up the long sides together, and fold over twice, as if closing a paper bag, creasing well after each fold. Then fold each end twice, the same way, only folding it under, so the packet stays neatly wrapped while it bakes. No worries - I had no idea what I was doing, and it all worked out great! Lay the packets on a baking sheet and bake for about 20 minutes. The fish will be steamed perfectly. If you are using thick pieces of fish you may want to check that it is done to your liking. Preheat oven to 325 degrees F (165 degrees C). Generously rub coconut oil in an 8-inch pan or use parchment. Whisk together oil, eggs, honey and vanilla extract in a large bowl. Add almond flour, cocoa powder and chips and/or nuts if using. Pour into baking pan and bake in the preheated oven until the center is set and edges pull away from sides of the pan, 20 to 25 minutes. A toothpick inserted into the center should be clean or have a few moist crumbs attached. DO NOT OVERBAKE. Prepare a 13" x 9" (33 x 23 cm) pan with parchment paper or coat well with coconut oil. Preheat oven to 350° (180° C). Melt chocolate and butter on stovetop over low heat, or in microwave for 2 minutes. Whisk until well blended and add sugar, mixing well. Add eggs and vanilla and whisk thoroughly. Add gluten-free flour and a pinch of salt and mix incorporated. Add chocolate chips if desired. Bake for approx. 25 minutes or until wooden toothpick come out with just a few crumbs - best not to overbake. Includes two newly-found snack loves - watermelon seeds and dried white mulberries. Ingredients: Quantity of each is up to you. Start with a handful of each, mix and match, add more or less - totally flexible! Store in a air-tight container and enjoy! Chill the freezer bowl of an ice cream maker in the freezer for at least 2 hours before making the ice cream. Combine all the ingredients in a blender and blend on high-speed until the strawberries are fully broken down and the mixture is creamy, 1 to 2 minutes. Transfer mixture to the chilled ice cream bowl and start the machine. Once churned, you can enjoy it immediately (a soft-serve textureA) or place it in the freezer until firm, 2 to 3 hours. Remove 10-15 minutes prior to serving to allow it to soften. Place all ingredients, except avocados, into a food processor or blender. Mix on high until well-combined. Add avocados and continue to blend until mixture is very smooth and creamy. Adjust sweetness to taste using additional maple syrup or stevia. Refrigerate for 1 to 2 hours before serving. 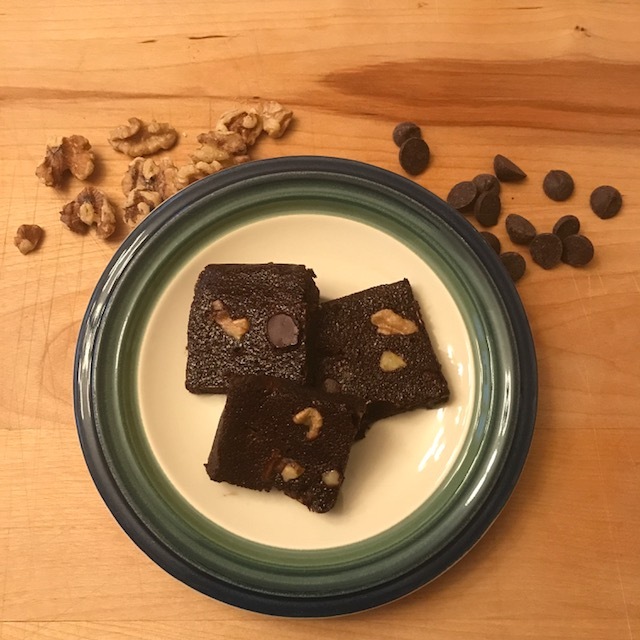 Delicious topped with nuts, berries, or chocolate chips. Bake at 350º F (180º C) for 15-18 min. Using a stand mixer or hand mixer, combine sunflower butter and butter on medium-high speed until fluffy - about 3 minutes. Add honey, vanilla and pinch of salt. Whip on high for another couple of minutes. Refrigerate until cupcakes are cooled and then frost. Sprinkle on mini dark chocolate chips if desired. Melt cocoa/cacao butter on lowest temp possible, just until melted. Remove from heat and whisk in coconut oil, cocoa powder, choice of sweetener and vanilla until smooth. Taste! If desired, add more sweetener or stevia. Taste again! When at desired level of sweetness, pour in a parchment lined 8x8 (~20 x 20 cm) inch pan, ice cube trays or silicone candy molds and place in the freezer. If adding candies or zest, remove after 10 minutes and sprinkle crushed candies or zest and return to the freezer for 5 additional minutes. This allows the candy not to melt or sink into the chocolate. After 15 minutes total, the candy should be firm enough to remove. Store in the freezer and enjoy often!